Studies show that tuna fish have been swimming in the Earth’s waters for as early as 45 million years ago — long before man has alive to hunt them. They have swum most of the Earth’s oceans which include all of the Atlantic, Pacific, and Indian Oceans, and also the Mediterranean Sea. Tuna belong to the Scrombidae family, a group which consists of mackerels, like the bonito and albacore fish. They can grow from one foot (bullet tuna) to approximately 15 feet (Atlantic bluefish) in length, with typical lifespans of around three to five years; however, special tuna fish, like the bluefish, are known to live for more than two decades. Tuna travel thousands of miles across oceans to mate and to live within the waters of their preferred seasons. It can be easy to fish for schools of tuna, since they like swimming in large vertical columns near the surface of the water. Because of the predictability in their migratory patterns, industrial fishing for tuna exploded in the 1940’s and 1950’s, with the skipjack and yellowfin dominating the canned and processed tuna industry. The most common health benefit of tuna fish is the wonders that it can do to your heart. Due to tuna fish’s increased levels of omega-3 fatty acids, which aid in the reduction of cholesterol in arteries and blood vessels, you can lessen the risk of incurring coronary heart disease if you religiously make a meal out of tuna. 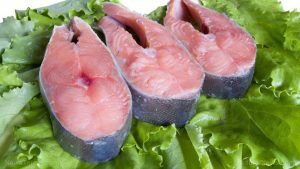 Tuna fish are a delicious treat for people looking to replace their red meat consumption with healthier alternatives. Since a single serving of only 165 grams (approximately one tuna fish can) already has more than 80 percent of your daily protein requirement, it is highly recommended for people who are on a diet. The proteins in tuna, after they are broken down into peptides upon being heated, contain powerful antioxidants that boost and protect cell membranes. And if you have healthy cell membranes, you are one step closer towards being protected from the risks of breasts, colon, and kidney cancer. By making sure that you eat a fair amount of tuna, you reduce the risk of getting sick from inflammatory diseases such as arthritis and gout. Also, since regular tuna intake can increase your metabolism, you have a powerful ally in your fight against obesity, plus the high energy and good skin to match your fit body. Ingesting tuna fish can reduce the risk of hypertension, thereby making your cardiovascular system healthy. Your body will also thank you for ingesting tuna, because it contains selenium, a mineral which is known for boosting the immune system. Eating tuna is equivalent to getting 200 percent of your body’s daily selenium requirement. A highly recommended way to serve tuna is to cook it steak-like. It can also be used to fill up a sandwich, or to replace the beef patty in a burger. It goes well spread with mayonnaise on crackers and as fillers for a salad. It can even be scrumptious mixed in pasta. Here are other meal suggestions. Tuna is good for the heart as it protects you against coronary heart disease. Tuna is packed with protein, which is good for increasing your metabolism, keeping you fit and full of energy. Tuna protects cell membranes and reduces the risk of breast, colon, and kidney cancer. Tuna is an ally to fight against inflammatory diseases such as arthritis and gout. Tuna reduces the risk of hypertension.